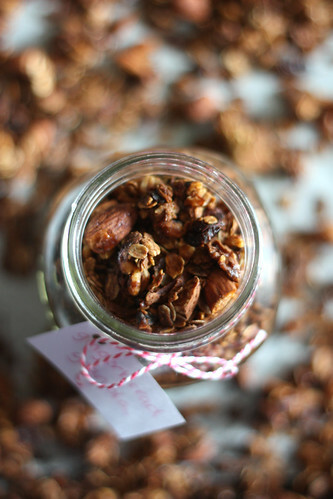 Gingerbread Granola – Elly Says Opa! To be fair, this granola is not terribly different from my regular one. It has oats, nuts, warm spices, and uses maple syrup for (part of the) sweetening. And, like my fallback granola, this one is pretty healthy, too. It takes just minutes to stir everything together, makes quite a bit of granola, and is shelf-stable for quite some time (if it makes it that long). Granola goes from perfectly baked to overbaked in about 4 seconds (a problem I also have with cookies of all kinds). Even though the granola may not seem crisp at the end of the cooking time, rest assured it will crisp as it stands. 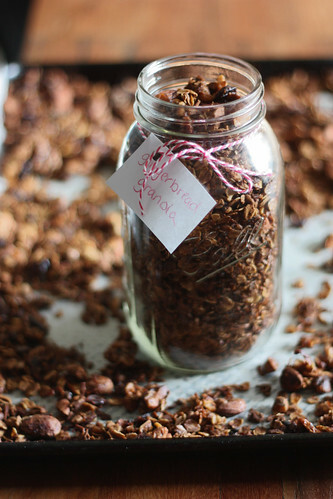 It’s been so long since I’ve made granola that I totally overbaked mine this time (sigh) so consider this a warning. Preheat oven to 325. Line a large rimmed baking sheet with parchment or spray will cooking oil. Whisk together the oil, maple syrup, molasses, vanilla extract, cinnamon, ginger, salt, cloves, and ginger in a large bowl. Fold in the oats, nuts, coconut* and dried cranberries*. Spread the mixture onto the prepared baking dish, pressing down lightly on the granola so parts stick together. 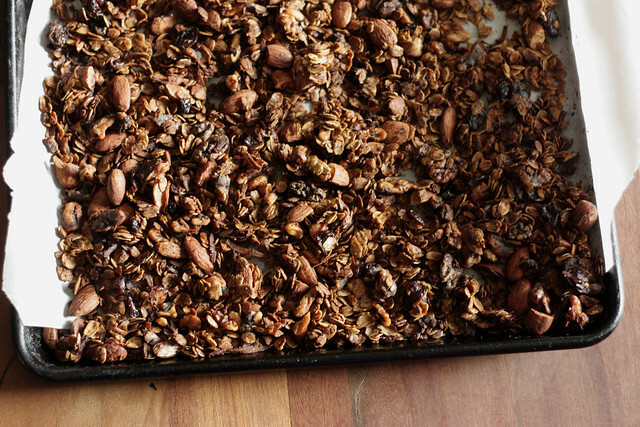 Bake for 20-25 minutes until granola is browned and fragrant. Once cooled, break into pieces and store in an airtight container. *You can stir everything together, as indicated in the recipe, or if you'd like plumper cranberries or less toasted coconut, you can stir those in halfway through baking or even at the very end.